The CJM Forward Inlet Manifold transforms not only the power-band of your VQ35DE, but the entire engine bay configuration. 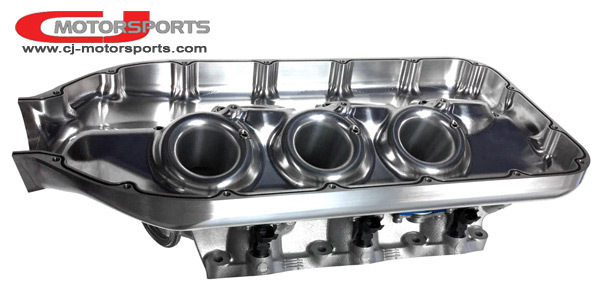 Intended for high-power forced induction applications, this manifold will produce major power gains from 6500rpm to as high as your engine can spin. 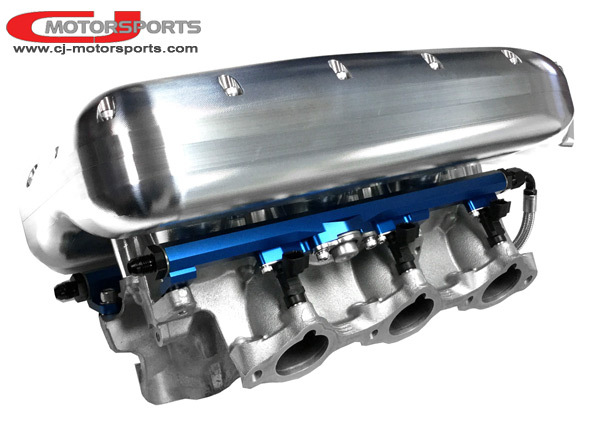 Tested against the factory inlet manifold, this design generated gains of over 100rwhp by 7200rpm. The power-band is transformed so drastically that its difficult to even compare. Results can be compounded by the power range of the project. By relocating the throttle to the front of the engine, the charge pipe system can be reduced by several feet. Serviceability to the coils and plugs is gained. Please scroll past the following image for additional details. The factory cast aluminum lower intake is retained, although efforts into porting and port-matching should be applied to optimize cross-sectional area and taper with our billet inlet. Current (2016) models being produced are constructed to use the Bosch Motorsports 82mm electric throttle. This is not enforced, and a manifold can usually be built around the original or other aftermarket throttles by request. Contact us by email for questions regarding alternative throttle applications. * Cast lower intake, billet fuel rails, and fuel injectors are shown in photograph for demonstration purposes only, and are not included with billet manifold purchase. It is important to note that this manifold is not designed to fit underneath hoods. The hood will require modification, and the front of the manifold will extend outside the hood unless a cowl is added. Original produced designs of this manifold would fit under some hoods, but often not. 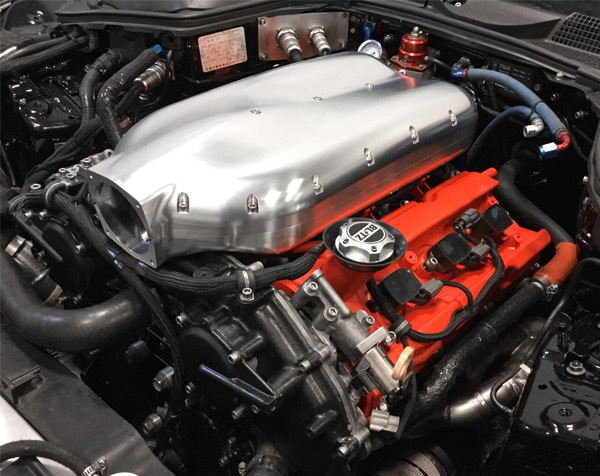 If hood clearance is a goal, attempts can be made to achieve it, but CJM will not guarantee hood clearance with any forward throttle VQ manifold. Compatibility and Fitment Information: Installation of this manifold requires advanced level understanding and experience. Some of the required tasks include: custom air inlet tubing, wiring harness modification, drilling/tapping manifold for desired vacuum/boost ports, and much more. These are currently built-to-order. 4-8 week production time is typical.